Euro 2020 qualifying gets underway this week and we have taken a look at all the groups and picked a winner from six of the ten UEFA Euro 2020 qualifying groups. See the reasons for each betting tip below and the best odds. There are some really short odds picks in the selection including England to top Group A and Spain to top Group F. Some of the other groups look tighter to call but you can see our selections below. England will take their chance in the Nations League semi-finals and final so they are in one of the smaller groups of the Euro 2020 qualifying. They have Czech Republic, Bulgaria, Montenegro and Kosovo in their group and it really should be an easy table topper for England. Czech Republic provide their biggest test here and they should get second place ahead of Bulgaria. Montenegro could be the unknown quantity of the group and Kosovo are making their debut. The next selection comes from Group B and we’re backing Portugal to top the group ahead of Ukraine and Serbia. The other teams in the group are Lithuania and Luxembourg and it is hard to see either of those sides having too much of an influence on the road to Euro 2020. Cristiano Ronaldo will be back in the Portuguese side and even though they have gone through struggles in recent years, they did win Euro 2016 and as well as being in the final stages of the Nations League, we’re expecting them to top this group. The troubles Germany have had over the past 12 months have been both on and off the pitch and following disastrous World Cup and Nations League campaigns, we’re betting on them to bounce back and cruise into Euro 2020 next summer. Netherlands will provide a stiff test to their rivals but they themselves have had troubles qualifying for recent tournaments. Northern Ireland, Belarus and Estonia probably won’t be good enough to challenge the big two. This is the Group that Wales find themselves in but we’re going with Croatia as group winners for our Euro 2020 qualifying betting tips. The Welsh are very reliant on Gareth Bale and if he gets injured their chances will be reduced drastically of qualifying for the tournament. Slovakia are certainly capable of troubling both Croatia and Wales and Hungary and Azerbaijan will be no pushovers, however the World Cup finalists should make it though as Group E winners. This is probably the easiest group of all to predict – Spain are clear favourites in the betting and it’s not hard to see why. Their main challengers will be Sweden who don’t look like the force of old. Norway and Romania might have a chance of getting second or third spot and it is hard to see the Faroe Islands or Malta challenging Spain. This could realistically be a maximum points haul for the Spanish. This group is probably the toughest to predict but we are going against favourites Poland and betting on Austria to get top spot and book a place at next summers European Championships. Poland had a disastrous World Cup and things didn’t get much better in the Nations League. Lewandowski is not scoring goals for his country and without that, they will struggle. Austria have had some good form in recent months and can top the group here to complete our accumulator. 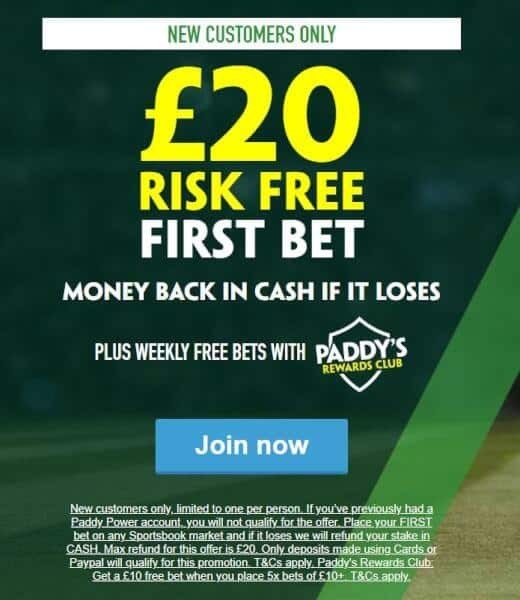 Open a new Paddy Power account to bet on the Euro 2020 qualifying this week and if you bet £20 and you lose, you will get a £20 refund in CASH!